Along with the popularity of the Home DIY Network we find a lot of homeowners attempting to be weekend warriors when it comes to a variety of home projects. The popularity of DIY isn’t exactly a bad thing as there can be a lot of satisfaction in completing projects to better your home. However, when it comes to large scale home improvements there are some important things to consider before just giving it the old college try. 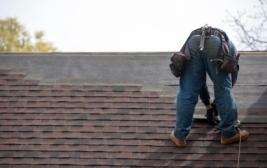 Roofing is a skilled trade that requires knowledge, proper safety precautions, and experience. Early spring in Michigan is typically when many homeowners start to evaluate the condition and longevity of their roof. Should you decide that it is time for a makeover on your roof we wanted to provide you with the top 6 reasons you should hire a Professional Roofer. #6 Cost Savings – To a do-it-yourselfer that might sound absurd. One might assume doing it yourself would lead to a significant cost savings. However, professional contractors can get materials for less and they already have all of the necessary tools to complete the project. #5 Access to Best Materials – Trust us when we say all roofing materials are not created equal. When it comes to protecting your home and all of your valuables you want to be sure to use quality materials that will prolong the life of your roof. #4 To Re-Roof or Repair – Professional roofers have an eye for when a roof (especially in older homes) can be salvaged with a few repairs or if it is best to have the whole roof replaced. #3 Speed – The roof of your home is protecting your family, valuables, etc. Many DIY homeowners who attempt to replace their roofs find that it takes weeks in some cases. An expert team can finish a roof and clean up in a significantly shorter time span. The less time your roof is open to the elements the better off your home and family will be. #2 – Warranties/Insured – Warranties on labor and materials can be requested from a roofing contractor. Also, Professional Roofers are required to have the proper insurance coverage to protect themselves, their team, and the homeowner. #1 SAFETY – Working on a roof can be very dangerous. It is imperative that the proper safety precautions and procedures are followed when roofing a home. Roofing contractors know how to get each project done safely and have the proper equipment to insure their team’s safety. American Classic would love to assist you or help answer any questions you may have when it come to your upcoming project.